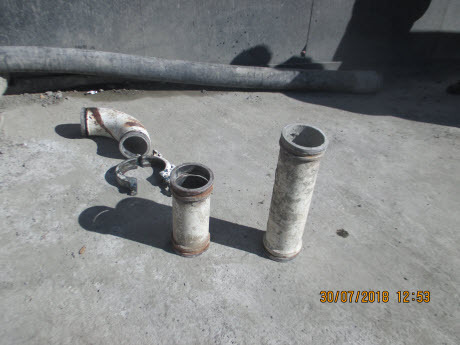 A 36-year-old male worker was when several concrete pump and delivery line components failed. A 36-year-old male worker was agitating concrete being poured into a column. A blockage in the pipework has caused a build-up of pressure. Several pump and delivery line components failed, resulting in the rubber discharge hose striking the worker. SafeWork NSW and NSW Ambulance responded to the incident. The worker was conveyed to Hospital and he received treatment for his injuries. Image of the rubber end (discharge) hose, coupling, elbow and two pump line components. The site is located on Epping Road at Macquarie Park. It is a high rise residential construction site and is under the control of a principal contractor. A sub-contractor had also been engaged to carry out the concrete pour. Our Prosecution Guidelines (January 2018) outlines our approach to prosecutions and Safe Work Australia’s National Compliance and Enforcement Policy provides guidance on their approach to compliance. These documents set out factors that will be considered in determining the investigative approach and appropriate outcome. Each year, we respond to incidents where workers have been struck by plant, including concrete placing equipment. Many of these incidents involve the sudden escape of pressurised concrete, the dislodgement or failure of pipeline components, or the sudden movement of the plant and/or components resulting from pressure build-up within the equipment. Workers in the construction industry are most commonly injured. restraining devices such as pins and circlips becoming dislodged.